Fix: issue with categories not being selected due to the move from jquery chosen to select2. New: save the location from the auto-locator in cookies for one day instead of getting the location on every page load. Tweak: allow deactivation of the plugin while license is activated. Tweak: increase transient expiration duration. Tweak: update license class. Add documentation and Settings links to the Plugins page. Additional minor bugs fix and tweaks. Fix: verify that a location is returned from the geocoder to prevent error messages. Fix: verify that $this->locations_data exists to prevent error messages. Fix: verify that $this->filters[\'radius\'] exists to prevent error messages. Fix: orderby filter doesn\'t work properly. Fix: make sure that the Hero settings of the Jobify theme apply only to the “flat” form of the home page. Compatibility: now compatible with the Listing Easy theme. Tweak: update some values in gjm_query_cache. Tweak: append jobs and resumes form with \'gjm-features-enabled\' class to easier control the form and geolocation features. Tweak: modify the Jobify Hero page to work with other themes as well. Tweak: show distance in Listify theme search results. Style: update general styling and styling related to different themes. Fix: issue with boundaries search when geocoding provides a state value when not needed. Fix: distance element shows even when the distance is not provided in the results. Update: try geocoding via HTTP when an address is provided but coordinates are missing. This mostly happens on page load when an address is provided via URL but not the coordinates. Update GEO my WP delete function. Compatible with GEO my WP 3.1. New: new static function GJM_Admin::import_locations() to import locations. It can now be used directly. Fix: load gjm-functions.php file in the back-end as well to be able to use its functions. Fix: hide filled jobs by default from Jobs global map. It can be enabled using the shortcode attribute show_filled_jobs. Fix: geolocation filters issue with Petsitter and Babysitter themes. Fix: some cases where results will show based on previous address entered. Fix: set min-width to info-window and styling for Wordscout theme. Fix: verify that the autocomplete field exist before tempting to enable the autocomplete to prevent errors. Fix: map won\'t trigger on some themes with a custom class name for the job_listing container. Fix: modify hook to display the distance in the WorkScout search results. Fix: gjmObject undefined in some themes. Enhancement: modify the way location being queried. Modify the clauses of the main WP_Query directly using a filter, instead of getting the location data and passing it to the “include” variable of the WP_Query. Enhancement: new global function gjm_update_location() to update job location. The function also updates location in the new database table of GEO my WP 3.x. instead of adding with MYSQL directly. Tweak: change gjmAddressAutocompleteFields variable to gjmAddressAutocompleteOptions which contains additional values. Tweak: remove gjmOptions variable. API values now pass via data attributes. Tweak: use a different hook to update location after imported from WP All Import plugin. Tweak: Don\'t load markers clustered library if WorkScout theme already loads it. Tweak: Add region and language API settings via data attribute instead of using localized gjmObject. Filter: new filter ‘gjm_default_radius_value’ to modify the default radius value in the drop-down. Filter: \'gjm_query_posts_without_location\' to enable / disable query of posts without location. Fix: units filter will not filter results properly. Fix: errors caused by code which was not properly commented out. Improve address geocoding JS functions. Improve performance, bugs fix and new features. Integration with Job Alerts. Setup alerts based on location and distance. Better integration with Indeed Jobs. Jobs from indeed will now display on the map. Better integration with different themes. Better integration with Jobify theme. New settings to enable the geolocation features on the Hero search of the home page. Fix: duplicate preset pages option in settings page when Resume Geolocation extension is enabled. Fix: job type slug shows instead of name in marker info-window. Fix: enqueue JS files only in pages where geolocation is enabled for Jobs forms. Fix: issue with search fires twice on jobs form. Fix: enable geolocation features only on forms with gjm_use enabled. Fix: license activation/deactivation doesn\'t work ( plugins page scrolls up instead ). Fix: modify the location of gjm_labels() function to allow to use its filter. Update: modify link to Google Maps API key tutorial in settings page. New: enable geolocation features on preset pages. New: set initial zoom level for the single job map. New: maximum zoom level settings for jobs map and single job map. Fix: prevent fatal error message when geocoding failed. Tweak: Add distance to search results of Listable theme. Fix: issue with map size not working when setup in settings page. Fix: Address autocomplete does not work in admin\'s Edit Job page. Tweak: Make compatible with WorkScout theme. Geolocation feature should now work with [jobs] and [resumes] shortcodes. Fix: Marker Clusters issues. Prevent Marker Clusters from disappearing when in lowest zoom level. Tweak: Spread markers that are at the same exact location. Slightly move markers that are at the same exact location to be able to click on. Note that since June 22nd 2016 Google requires an API key in order to use its Google Maps features. Tweak: New input box for Google Maps API added to the Settings page ( GEO General Settings tab ). Tweak: Add Google API key to the Google Maps call. Hook: Add filters to modify the Google API call. Fix: Jobify theme menu disappears when Job Gelocation add-on activated. Fix: Map in single job page cannot be disabled. Fix: location of map on single page of Jobify theme. Fix: styling issue with Jobify theme - change search form filter priority and adjust CSS styleshit. Fix: Force new clusters images path if set to old path. Fix: issue saving location when company information is missing. Fix: Language files are not loading. Fix: Jobify theme styling. Wrong position of submit button. Fix: wrong date showing in map info-window. Fix: Conflict with Jobify theme and Applications rating Icons. Prevent GJM stylesheet from loading on applications pages when Jobify theme activated. Fix: remove warning when saving a job. verify the value of all job form\'s fields before trying to save to database to prevent warnings/erros. Tweak: modify font icons structure to prevent conflicts. Change the font icons usage to “gjm-icon-“ instead of “icon-“ and the icons font family to \"wpjm-geolocation\" to prevent conflicts with other themes and plugins. Hook: new filter to modify the default orderby dropdown value. Use the hook apply_filters( \'gjm_default_orderby\', $query_args[\'orderby\'], $this ); to modify the default orderby dropdown selectbox value of jobs search form. Shortcode: Use the shorcocde [gjm_single_job_map] to display the single job map (on a single job page ) anywhere on the page or a text widget. Fix: No results showing when location fields left blank. ( if you still get no results after the update you should navigate to the admin \"Edit Job\" page of any of your existing jobs and click the \"Update\" button. Doing this will reset the internal cache of WP Job Manager plugin ). Fix: Remove unwanted alert message. Tweak: Allow country and state boundaries search. When entering only country or state in the \"Location\" fields the plugin will search for all locations within that country or state instead of doing a proximity search. To enable this feature you need to add the line of code add_filter( \'gjm_search_within_boundaries\', \'__return_true\' ); to the functions.php file of the active theme of your site. Tweak : add \"types\" option to Google Places address autocomplete ( GEO General Settings tab ). Tweak: set orderly to original value set by WP Job Manager plugin if no value chosen from the orderly dropdown. Tweak: use a different filter to fire the address autocomplete on new Job form in front end to prevent issues when disabling company fields. Fix: added back class tags to form filters to fix issue with JobSeek theme. Fix: Prevent multiple maps showing on single job page. Fix: Conflict with Job-Seek page load. Fix: Load the default list of results before the automatic page-load if trying to retrieve the current position. Feature: Set URL to custom clusters images. Feature: Set custom URL to clusters images and custom markers for global maps. Fix: CSS for Jobify theme. Fix: use version_compare function to compare plugin versions. Fix: google maps API doesn\'t load when GEO my WP plugin activate. Fix: info-window content filter set incorrectly. Fix: Global Map showing incorrect post date. Added global $post into the loop. Fix: Conflict between the licensing system of GEO Job Manager and WP Job Manager plugins. Added a submit button click check. Compatible with WP Job Manager 1.21.3 and up. It will not work properly with lower versions. New columns \'street_name\' and \'street_number\' added to the custom table of the pugin to better fit the new version of WP Job Manager. New: Import location to GEO Job Manager when importing using WP ALL Import plugin. Tweak: Added input box for region to be used as the default region of Google API. Tweak: Locations importer added. The importer can be used to import jobs and resumes location entered previously the installation of GEO Job Manager and Resume Manager Geolocation plugins. Fix: make sure that updater file was not already included to prevent conflict with other plugins. Fix: make sure global map being generated only one on a page to prevent conflicts. New: [gjm_jobs_map] shortcode displays all job on the map. Fix: \"Sort by\" default value is now the default value of set for Wp Job Manager plugin. Fix: Sort by \"feature\" was not displaying correctly. Now when choosing to sort by \"Feature\" feature jobs will show on top and the rest will be ordered by the distance. Fix: issue with \"anywhere\" jobs were not displaying when not searching by location. Fix: delete locaiton from GEO Job Manager database table when no location entered for job. Fix: Map zoom too far when going from no results to showing results. Very Important - You will need to re-save GEO Job Manager settings after this update. Improved autocomplete feature using Google Places. Set Google API language which controls the results of the autocompelte and the map. New feature: Map for single job page. Note that this extension DOES NOT work with the Workscout theme at the moment. Please do not purchase this extension if you are using the Workscout theme. Job Manager Geolocation extension provides Geolocation features to the free plugin WP Job Manager. Why Should You Use WP Job Manager Geolocation? While WP Job Manager plugin does a great job searching for jobs by location, it does it by searching the location’s keywords entered by the user to the location’s custom field in database. This way the matching results will usually be jobs from matching city or zipcode. WP Job Manager Geolocation add-on enhance this functionality of WP Job Manager plugin and adds a “real” geolocation based jobs search. With WP Job Manager Geolocation add-on, when creating or editing a job, the location entered is being geocoded using Google API and the address components, together with the latitude and longitude of the location, are being saved in database. Using the latitude and longitude of the locations and the extended search query of WP Job Manager Geolocation add-on, WP Job Manager can do a proximity search for jobs, based on address and distance, which will display results nearby the address entered. GEO Job Manager is not fully compatible with Listify theme. 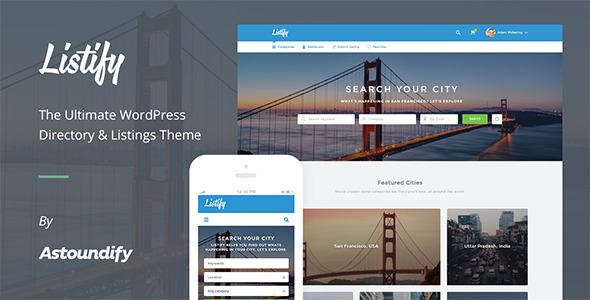 If you are using Listify theme with you website it IS NOT recommended that you purchase GEO Job Manager add-on. Refund will not be provided if you are experiencing any conflicts between GEO Job Manager add-on and Listify theme. Search for jobs based on address and distance. When displaying search results you can choose to also display Google map with markers representing each job’s location in the list results. The map will be displayed above the list of results. When searching for jobs by location you can choose to order the list of results by distance. This way users can see which job is the nearest to their location. Geo Job Manager add-on enhance the “order by” functionality as well and now let you create a dropdown select box and let the users change the order of the results. You can easily create a dropdown select box with any of the values: Distance, Title, Featured and date to be sorted by. Add a button that will automatically get the user’s current location and submit the search form based on that. Note that nowadays, most browsers require a secure page ( SSL ) in order to use the auto-locator features. Otherwise, the locator button will fail and show an error message. Add the “real” distance from the address entered to each job’s location in the results. The distance value will be added next to the location in the list of results. Add Google’s address autocomplete to the location field of the new/edit post screen in the admin, new/edit job form in the front end and to the location field of the jobs search form. Google address autocomplete will display suggested results while the user is typing an address. Group map markers together when locations are near each other. Display map showing job’s location when viewing single job page. Display map showing all jobs location or set the maximum number of jobs that will be display. Using a shortcode you can display the map anywhere in a page/post content or in a template file ( see bottom of this page for shortcode usage).